The quote below is from At Home in the World: The Letters of Thomas Merton and Rosemary Radford Ruether. The book is out of print, but I have ordered a used copy. Rmj at Adventus quoted the words at his blog, and I borrowed them. Merton: I do wonder at times if the Church is real at all. I believe it, you know. But I wonder if I am nuts to do so. Am I part of a great big hoax? I don’t explain myself as well as I would like to: there is a real sense of and confidence in an underlying reality, the presence of Christ in the world which I don’t doubt for an instant. But is that presence where we are all saying it is? We are all pointing (in various directions), and my dreadful feeling is that we are all pointing wrong. Yes, I suspect we are getting it wrong. This past April, I stopped going to church altogether, because of pain due to a bad back which limited my activity. I've been a lifelong churchgoer, though I changed denominations, but I found I didn't miss church attendance, which surprised me greatly. Looking back now, I remember thinking about church, "What are we doing, and why are we doing this?" Now I'm wondering if it was habit more than anything else that kept me going for so long. Also, when I was involved in several ministries in my church, it all seemed to make more sense, but, as my health deteriorated, and I gradually eased out of ministry, I began questioning. As long as I was busy in the church, it seemed fine. I read the Scripture passages for the day from the Lectionary and say my prayers at home; I'm immensely grateful for the Book of Common Prayer of the Episcopal Church. The 1979 version in modern English retains some of the grandeur and flavor of Thomas Cranmer's beautiful but simple language in the older version and includes at least some prayers in the old language. My faith in the teachings of Jesus as a way to live my life remains firm, as does my faith in God, although my concept of who God is and how God relates to me is much less certain. My one true certainty is God is love, or God is not my God. Having said that, I have no idea how to get church right, except a vague idea that perhaps the Christian church ought to be poor and on the fringes of society and not so much about elaborate buildings. It appears churches may get to such a place by force, as attendance drops and funding dries up. I still believe Christian community is important, but I am open to the idea that community can take many forms outside the traditional gathering in a building. In no way do I mean to disparage my parish church community; the rector is a fine man, and the members of the parish are good people who obviously live the Gospel as best they can. I doubt that I'd find a better church anywhere nearby, and I'm certainly not looking. I'm enormously grateful for my religious upbringing; the family I grew up in, with the exception of my maternal grandmother, was not especially devout, though my mother attended church regularly. Somehow the Christian teachings in my schools stayed with me for a great part of my life, though my practice and theology evolved over the years. Being brought up in the church through religious schooling seems not to be what it once was. All my grown grandchildren who attended Catholic schools from an early age do not regularly attend church. Their families were not especially devout, but, either the teachings in the schools have changed, or they just didn't persuade my grandchildren that church attendance was important. All that being said, if I could, I'd very likely attend church during Advent, the season of waiting and expectancy for the coming of the Kingdom of God, which is right now and not yet. I will very much miss my favorite service of the entire church year, the Christmas Eve service, when we celebrate the coming of Emmanuel, God with us, in the form of a baby, born of a woman in a humble shelter for animals. Now, I take my community where I find it, and I found my sermon for the First Sunday in Advent at Adventus, by my friend Rmj. 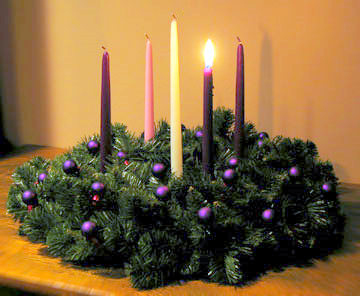 Advent is about preparing for the coming, again. Christmas is about the coming that has already happened. Advent reminds us to wake up, look around, see a world that needs what is coming, what has come, and who came, and what happened after that. We start over again, to end in four weeks with what we anticipated this time; and still we are surprised by it. Christmas is about the same thing every year, and every year we need to see again that what we waited for, what we are waiting for, is already here.